The 2017 Web Summit began yesterday with a star-studded guest list. The expectations are high for the tech conference in Lisbon. Web Summit summoned, and roughly 60,000 startups, techies, investors and journalists answered the call. This is the second time the conference has been held in the Portuguese capital city after 2016. Despite its enormous scale, you hardly notice the conference in the heart of the city. The event is taking place at the exhibition center that was built for the 1998 Expo. Within eyeshot of the Vasco da Gama Tower, Portugal’s tallest building, and Europe’s longest bridge that was named after the same explorer, the Vasco da Gama Bridge, Web Summit fills up all four of the congress center’s pavilions. 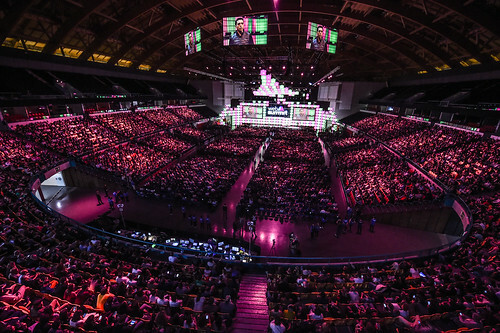 The main stage is located in the neighboring Altice Arena — Portugal’s largest indoor arena. With so many superlatives, the long line at the entrance for opening night comes as no surprise. 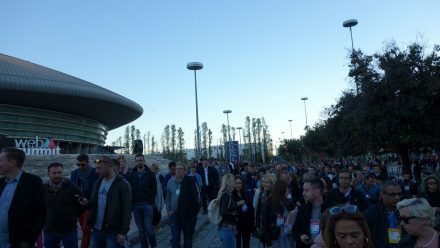 Only guests who registered beforehand are allowed to enter for opening night, but it still takes some time for the 20,000 seats to fill in the UFO-shaped arena. Web Summit CEO Paddy Cosgrave launched the stage event. The explorer motto is maintained throughout the evening: Feedzai CEO Nuno Sebastião views the conference in light of the Portuguese spirit of exploration. Portugal’s Prime Minister António Costa drew the lineage of tradition from Vasco da Gama to Web Summit. Vestager repeatedly threw punches at American tech companies, saying they are only interested in their own advantage. She mentioned she never feels more European than when she is staying in the US. Because countries are no longer able to shape the changes triggered by the fourth industrial revolution — meaning digitalization — events like Web Summit are necessary. The conference’s mission is to put technology and science at the service of humankind by examining the impact of digitalization. The goal is to link freedom of innovation with human rights. The extent to which Web Summit will meet these challenges will become apparent in the days that follow. The actual conference program begins today.